Location: Merville, in the Haute-Garonne departement of France (Midi-Pyrenees Region). Notes: Château de Merville is located in France in the department of Haute-Garonne and the region Languedoc-Roussillon, Midi-Pyrenees in the town of Merville. 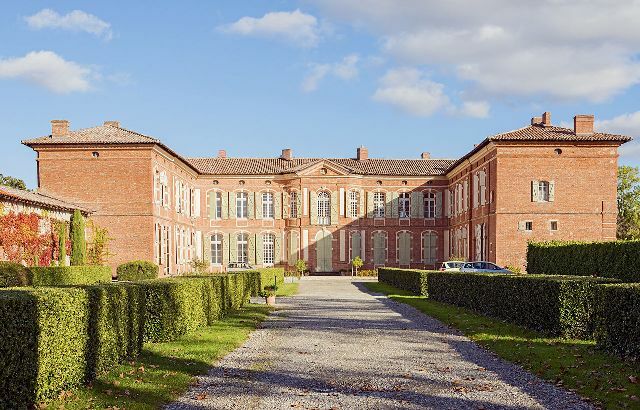 Located 20 km from Toulouse, the Château de Merville Park and are a unique testimony of the architecture and art of the eighteenth century gardens in Midi-Pyrenees. Its labyrinth of 6 km of paths lined with high walls boxwood, genuine curiosity, is the largest in Europe boxwood maze.The Castle and Park are classified Historical Monuments and the Labyrinth Garden Remarkable label by the Ministry of Culture.Merville Castle was built by Henri Auguste de Chalvet, the descendant of Mathieu Chalvet who had bought in 1575 all land rights of Merville. At the time, there were two mansions in Merville in the walled enclosure. The style had nothing of medieval castles, there was neither round nor niches. In 1734, Henri-Auguste Marquis de Chalvet-Rochemonteix, high steward of Toulouse and Albi, inherits his brother acquired the lordship of the Marquis de Boisse Escoda, and decided to build a beautiful building of red brick, whose construction began in 1743. a true man of the Enlightenment, he dictated himself building plans to the Toulouse architect Maduron. The work lasted a little more than fifteen years. On the death of the Marquis of Chalvet, in 1772, the castle passed to his son André Antoine, who, though imprisoned under the Terror, manages to keep his head but his castle! Luckily, Merville retains its furnishings and decor. The granddaughter of André Antoine brings Merville Villèle in the family, then the house passes by inheritance to the Marquis de Beaumont's Lair which descended the present owners. The ceremonial parts of the central body have been designed in a row around a large living room that juts out over the garden. With its tiled floor, its French ceiling and its three doors, this octagonal summer lounge almost seems so rustic decor was whose incredible sophistication only matched the exotic. The walls of the large rooms on the ground floor are covered in Flanders tapestries dating from the reign of Francis. The "Chinese Room" named after the large eighteen wooden panels painted in oil that adorn the walls and above door. They were made during the 1754 years by the painter and architect Gilles Toulouse Pine (1720-1804). These decorations in the style of Pillement chinoiserie inspired by Parisian engravings after drawings by François Boucher.The picture gallery occupies a first floor room. There are portraits of Merville lords and family members. The castle itself, it was classified as a historic monument, its beautiful architecture is pure eighteenth century.